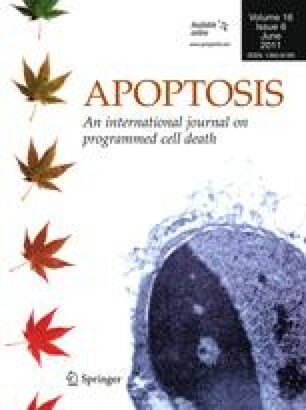 Apoptosis is a complex pathway regulated by the concerted action of multiple pro- and anti-apoptotic molecules. The intrinsic (mitochondrial) pathway of apoptosis is governed up-stream of mitochondria, by the family of Bcl-2 proteins, and down-stream of mitochondria, by low-probability events, such as apoptosome formation, and by feedback circuits involving caspases and inhibitor of apoptosis proteins (IAPs), such as XIAP. All these regulatory mechanisms ensure that cells only commit to death once a threshold of damage has been reached and the anti-apoptotic reserve of the cell is overcome. As cancer cells are invariably exposed to strong intracellular and extracellular stress stimuli, they are particularly reliant on the expression of anti-apoptotic proteins. Hence, many cancer cells undergo apoptosis when exposed to agents that inhibit anti-apoptotic Bcl-2 molecules, such as BH3 mimetics, while normal cells remain relatively insensitive to single agent treatments with the same class of molecules. Targeting different proteins within the apoptotic network with combinatorial treatment approaches often achieves even greater specificity. This led us to investigate the sensitivity of leukemia and lymphoma cells to a pro-apoptotic action of a BH3 mimetic combined with a small molecule inhibitor of XIAP. Using the computational probabilistic model of the apoptotic pathway, verified by experimental results from human leukemia and lymphoma cell lines, we show that inhibition of XIAP has a non-linear effect on sensitization towards apoptosis induced by the BH3 mimetic HA14-1. This study justifies further ex vivo and animal studies on the potential of the treatment of leukemia and lymphoma with a combination of BH3 mimetics and XIAP inhibitors. S. C. Das and A. Nair contributed equally to this article. The online version of this article (doi: 10.1007/s10495-011-0593-1) contains supplementary material, which is available to authorized users. We are grateful to Prof. R. Dunbar (SBS, University of Auckland) for providing U937 and peripheral blood mononuclear cells, Prof B. Baguley (UoA) for providing Raji CEM and HL-60 cells, Dr J. Taylor (SBS, UoA) for THP-1α cells, and Dr D. Wlodkowic (Department of Chemistry, UoA) for providing PhiPhiLux-G1D1 reagent.